Rev: Russian eagle, and Swedish and Danish shields in laurel over landscape with bridge over Kymmene River; Legend in Cyrillic translated as: "River Kimis- the Border Between Two States. In Memory of the Imprisoned in the Name of Eternal Peace". Åbo (Turku), is the capital of Western Finland, at the mouth of the Aurajoki River on the Baltic Sea. Known as the ""cradle of Finnish culture,"" Turku is among Finland's oldest cities. Swedish Crusaders landed on the site in 1157. It was the seat (1220) of the first bishop of Finland, and the capital of Finland until 1812. The national university was in Turku from 1640 to 1827, when a fire destroyed almost the entire city and the university was moved (1828) to Helsinki. The great cathedral was begun in the early 13th century. The 13th-century castle, burned in 1614 and restored in 1961, is now a historic museum. Turku has a Finnish university (founded 1917) and a Swedish university (founded 1918). 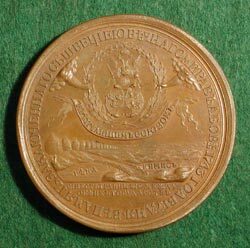 The Treaty of Åbo or Treaty of Turku was the Peace Treaty between Imperial Russia and Sweden by which Sweden ceded part of Southeast Finland to Russia. Russia, in turn, guaranteed religion, properties, laws and privileges of the inhabitants of the ceded territories. 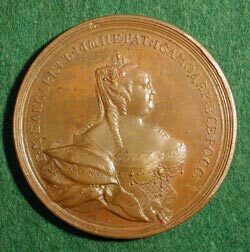 The treaty, which was signed in 1743, is commemorated by this medal.